Roadmap to High Galdr Rune Work provides a cut-down curriculum designed to offer key practices (taken from the first four High Galdr books) you will need to master in preparation for High Galdr. Working through it will gives you all the essential skills needed to tackle actual rune work. This is the book for those of you who wish to spend as little time as possible on your foundational skills and development. Roadmap to High Galdr will offer you a speedy pathway through the content of the four initial titles. For those of you not too concerned with development of the Self but keen to start your rune work as soon as possible this guide is essential. The fourth and final preparatory title for High Galdr! It will take you through a discovery of biological awareness, the importance of Blood & DNA, the energy body (Hamr) and Shadow Self (Sal) theoretically as well as practically. In addition to all this, the final preparatory practices to learning how to unleash Intent are given. Learn how according to Norse teachings man and woman came about and why mankind has such a unique and powerful heritage! This third title of the High Galdr series leads into the mysteries of the Spirit, looking at how everything is created by Spirit and how to replicate this yourself. It teaches how to break the shackles of the mind, rid yourself of the mind ‘thief’, reclaim energy stuck in life experiences, old relationships and more. It teaches you about Intent, the use of memories, to map consciousness to the runes and to build the ‘Norse holy grail’ within, leading to with Spirit projection! This is the starting point, learn all about Megin (Power), the Hamingja (energetic organ which produces Megin), and the Breath of Odin (Megin fuelled breath). Within its pages find all the theoretical information and practical exercises enabling you to learn how to wield that inherited power to make actual changes not only to your life but to your Self. Without power no ability works, with excess power YOU evolve! Welcome to HighGaldr.com! The definitive source for all things Norse and Rune / Runic Mysticism. The work of Frank A Rúnaldrar is a must for anyone studying (or is just curious about) the runes. Its in-depth look at the tradition, at sources of information passed on through generations and from the Nine Worlds is not to be missed for those seeking to deepen their understanding of the most powerful mysteries of the indo-European people. Drawing heavily on historical sources (the Eddas & Sagas) whilst preserving their teachings without diluting them with 'third party' traditions, the works presented are academically, historically and traditionally accurate whilst taking in the context of modern day understanding and developments. This is your chance to gain knowledge and insight, presented in an accessible fashion with the aim to guide you to full actual Galdr mastery (as practiced in Asgard). These works do not require either a belief in or active participation in the Norse 'religious practices'. For those of you who are just interested in pure mysticism, cosmic and energetic understanding these will prove to be a treasure-trove of practical information. Using Runes (Elder Futhark) to unlock the mysteries of creation, expanding consciousness, deepening understanding of the Self and spirit are all present. The one thing you WILL find in these books are practices, theories, and explanations which work and produce results. Anyone looking for a boost in their understanding of life or a 'helping hand' from the spiritual will be able to find something of value in these books. Much of our feedback comes from people from all walks in life, both spiritually aware and non-aware individuals who have for the first time picked up one of these titles. Reports of success and achievements are common and a delight to read through for both the publishers and the author. Everyone can find value in the knowledge and insights provided from the High Galdr series of books. The amount of information is vast and as such it is taking time to edit and publish. We are working as fast as possible; to get all these books out as quickly as possible, it is no easy task to say the least. The publishing structure is to get the initial four books out which are the preparatory materials required for actual Galdr followed by the three titles which deal with High Galdr itself. Additionally, due to all of the feedback, questions and requests 'Questions & Answers' editions are being published as and when possible. 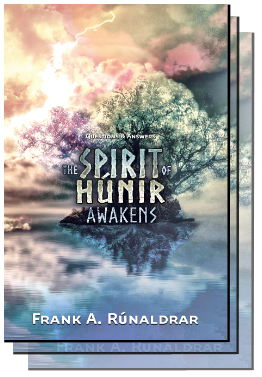 Frank A. Rúnaldrar titles now available at Waterstones! We are pleased to inform Frank’s readers that it is now possible to buy his titles through the UK wide high street book chain Waterstones. We will also be providing links on each book’s web pages to their respective listing on Waterstones.co.uk. If you would like to view all his titles please follow this link: Rúnaldrar @ Waterstones (UK). This does not include pre-order only titles.